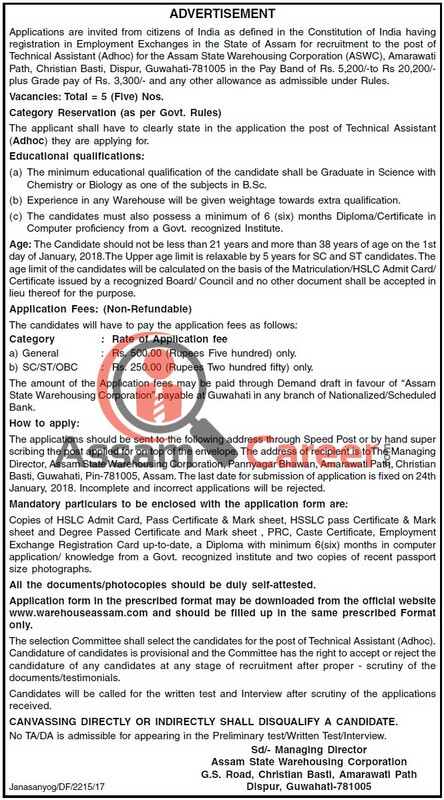 Applications are invited from citizens of India as defined in the Constitution of India having registration in Employment Exchanges in the State of Assam for recruitment to the following post for the Assam State Warehousing Corporation (ASWC), Amarawati Path, Christian Basti, Dispur, Guwahati-781005 . No of posts: 5 (Five) Nos. How to apply: The applications should be sent to the following address through Speed Post or by hand super scribing the post applied for on top of the envelope. The address of recipient is to The Managing Director, Assam State Warehousing Corporation, Pannyagar Bhawan, Amarawati Path, Christian Basti, Guwahati, Pin-781005, Assam. Mandatory particulars to be enclosed with the application form are: Copies of HSLC Admit Card, Pass Certificate & Mark sheet, HSSLC pass Certificate & Mark sheet and Degree Passed Certificate and Mark sheet , PRC, Caste Certificate, Employment Exchange Registration Card up-to-date, a Diploma with minimum 6(six) months in computer application/ knowledge from a Govt. recognized institute and two copies of recent passport size photographs. The selection Committee shall select the candidates for the post of Technical Assistant (Adhoc). Candidature of candidates is provisional and the Committee has the right to accept or reject the candidature of any candidates at any stage of recruitment after proper - scrutiny of the documents/testimonials. Candidates will be called for the written test and Interview after scrutiny of the applications received.